HappyMommy HappyRachael: Denver, so far. We have had quite the time already. We have laughed and we have cried (only because I stuck my mascara wand in my eyeball by accident). We have played in the sun and the snow. 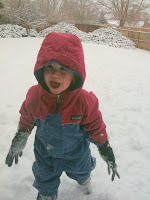 Ok, the kids played in the snow because I hate being cold and complained the whole time, but whatever, they had fun. Except for the fact that I didn't pack snow appropriate mittens for either child. James ended up having to wear my SIL's gloves, which was pretty funny and Lilly ended up being so cold that she started bawling. Only later did we find out that grandma, of course, had a whole basket of mittens. Not sure why we didn't realize this as grandma has everything. Here is an example of how together my mother in law is and she claims it because she is a product of her mother who was a product of the depression. She can't stand to not have something she needs on hand at all times. I am cooking Christmas Eve dinner and made of a list of the things I need. Random things, like 1/2 & 1/2 and Lawry's Seasoning Salt. As soon as she walks in the door from work, she goes over the list and marks all thirty or so things off the list because she has them all. CRAZY! 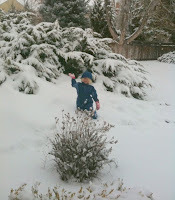 And here are the kids playing in the snow as I complain about being cold. Please note the sad state of affairs known as their gloves. Bad happymommy!